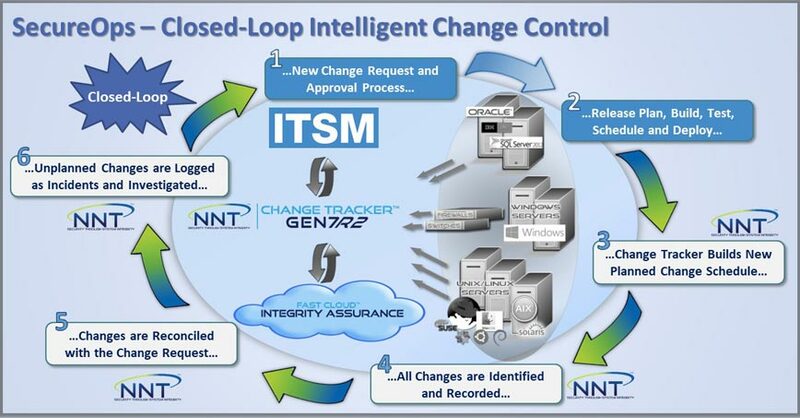 NNT has integrated its award-winning Change Tracker™ Gen7 R2 with the leading service management frameworks to enable a closed-loop environment for change management tools. Approved and authorized changes issued by ITSM tools can be validated by NNT Change Tracker™ Gen7 R2, with a full audit trail of what actually changed and reconciled with the Change Request(s). By leveraging NNT’s Closed Loop Intelligent Change Control Technology, repeated or recurring change patterns can be captured and identified as either harmless or potentially harmful as well, discriminating pre-approved changes from unexpected and unwanted changes. Pre-approved changes may also be forensically profiled ahead of time in order to spot any deviations that may indicate ‘insider threats’. This approach drastically improves the ability to spot potential breaches by reducing the “change noise “and exposing insider and zero-day malware activity. This approach also helps enable SecureOps™. 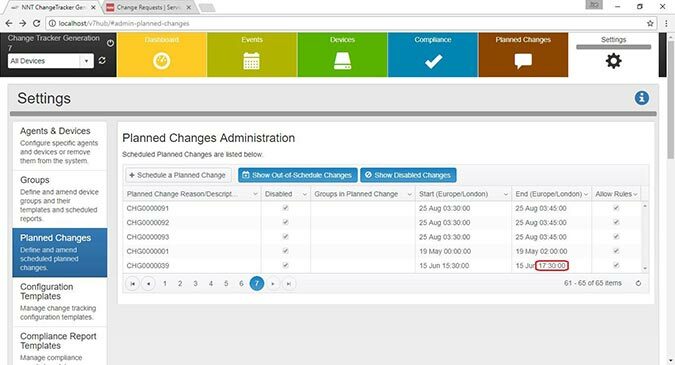 Validate approved changes automatically with a full audit trail of what actually changed provided. Significantly reduce overwhelming change noise to clearly expose insider & zero-day malware activity. Re-use recurring change patterns to isolate pre-approved changes from the unexpected & genuinely suspicious changes. Investigate unplanned changes in full, with who made the change and before & after exposure of changes clearly reported. Automatically analyze changes using continuously updated Threat Intelligence- NNT F.A.S.T Cloud™. Approved changes are validated automatically, with a full audit trail of what actually changed provided and reconciled with your Change Requests. By leveraging Change Tracker Intelligent Change Control™, repeated or recurring change patterns can be modeled and re-used to segregate pre-approved changes from the unexpected and genuinely suspicious changes. This reduction of change noise revolutionizes breach detection, clearly exposing insider and zero-day malware activity. Changes made during a prescribed planned change window get validated against the expected change profile - any exceptions, such as misconfigurations or additional no scoped changes are exposed for review and remediation where required. All Unplanned Changes are also recorded in full – Who made the change, with before and after exposure of changes clearly reported. 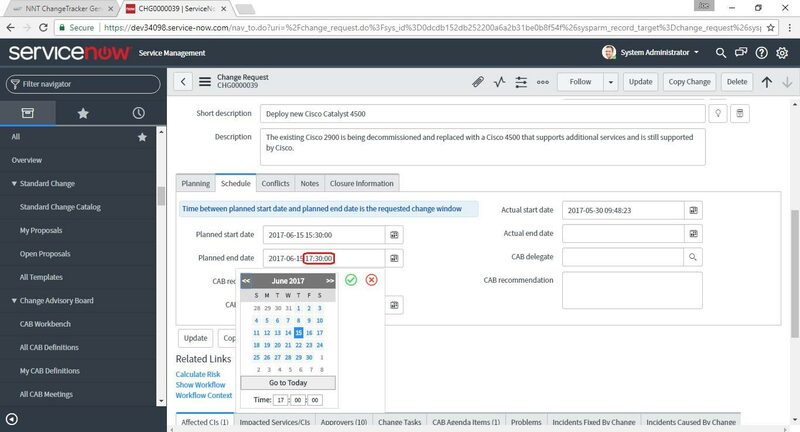 These are prioritized as ITSM incidents – changes will be automatically analyzed using continuously updated Threat Intelligence – NNT F.A.S.T. Cloud™.